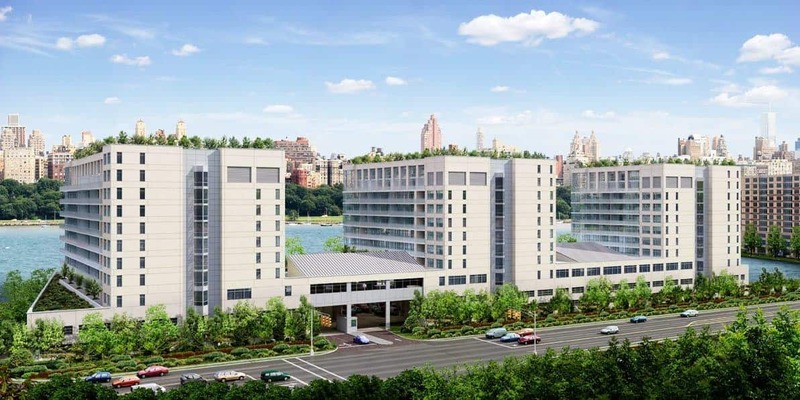 The project includes a two-story base consisting of an open-air, above grade parking garage facing River Road and 23 duplex single family townhouses fronting the Hudson River. Above the two–story base are 233 apartments within the residential towers. The third floor level houses the lobby, with amenity spaces such as a ‘club room’ event space, playroom, fitness center, indoor pool and spa, a landscaped exterior space, and residential units with large outdoor terraces. The residential floors above have apartments varying in size from studios to four bedroom units all with outdoor balcony space. The top two floors are setback and configured as duplex penthouses with double height space. Exterior materials include metal panel and stucco with punch widows on River Road, to create a more solid street facade. The residential tower ‘fingers’ extend out towards the River with floor to ceiling glass. The roof structures above the amenity spaces are articulated in shaped standing metal roofing, expressing their interior volumes.